Were you there when the playground at Midgley School was transformed into a winter wonderland on January 14 1960? 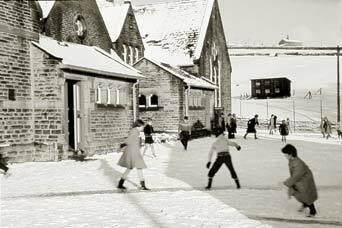 Snowball fights and sliding on the ice were huge fun - no-one minded attending school that day! Photo by E F Moses courtesy of Rodney Collinge (Click image above to enlarge). Milltown Memories is a glossy magazine devoted entirely to the Upper Calder Valley, West Yorkshire. Issue 10 is now out. Click items on the left for taste of features and photos included in the Summer 2004 issue of Milltown Memories. Or click on the photo above to see a larger version. Issue 10 is on sale (£2.80) now throughout the Upper Calder and at selected outlets in Halifax. You can order online this and previous issues, or by post from Milltown Memories at: 6 Melbourne Street, Hebden Bridge, HX7 6AS. Tel: 01422 845050. A subscription makes an ideal gift!